We´ve all seen the pictures and heard about the situation in Japan. Some people decide to act on it and give a helping hand. 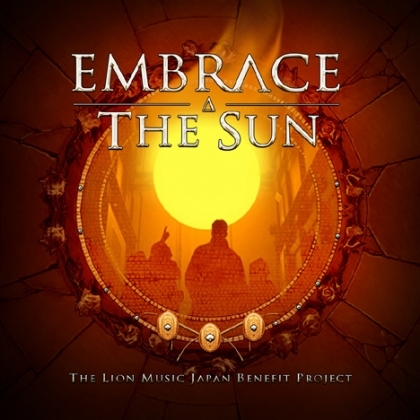 LARS ERIC MATTSSON has gathered the finest his Lion Music rooster has to offer for this 2CD, the revenue from which goes straight to the affected in Japan via the Japanese Red Cross. Newly written and never before released tracks from 27 artists/bands, crowned by a special guitar extravaganza called “Embrace the Sun”. The latter features Lars Eric, Borislav Mitic, Milan Polak, Dave Martone, Franck Ribiere (DOUBLE HEART PROJECT), Simone Fiorletta (NO GRAVITY), Francisco Fareri and Daniel Palmqvist of MURDER OF MY SWEET. There are so many tracks on offer here, something for everyone I believe. There are some categories; the straightforward vocal tracks, best represented by LOCOMOTIVE BREATH, MISSING TIDE and SECTION A. Then there are the soft and ominous presented by the likes of MISTHERIA featuring LANCE KING and TOMORROW´S EVE, and a heap of well-executed neoclassical or instrumentally focused speedballs like EMIR HOT and BENNY JANSSON. The strict instrumentals come from hotshot guitarist Marco Sfogli, and the persevering JENNIFER BATTEN. Two songs that attract my attention are MATTSSON´s faschinating “Mother”. Not as distant and difficult for a non-musician as their stuff sometimes are, and graced with a heavy but different guitar pattern and a fine refrain. The second is also track number two, Milan Polak´s “End of Time”, fascinating guitar work from several guitarists plus a brooding theme. The let downs come from the overworked arrangements of INFINITY OVERTURE, and STATUS MINOR and the odd ASHENT. But three tracks out of 27 isn´t much to make a fuzz about. Plus the cause, which is a heartfelt one, unpleasantly close to home since Japan isn´t the only ones with nuclear power plants. I recommend this one for several reasons! MILAN POLAK "End of Time"
DREYLANDS "Life Is Worth the Pain"
LOCOMOTIVE BREATH "Rise Up (Perspective of the Common Man)"
INFINITY OVERTURE "Do You Care?" OVERDRIVE "New Beginning (Arata Na Staato)"
EMIR HOT "Fear of the Storm"
TOMORROW´S EVE "Black Barren Lands"
IRON MASK "Sons of the Sun"
THE LIONS "Embrace the Sun"